How do these hinges compare to Soss in cost? What is the fire rating on these hinges? From what material are the hinges made? Do I need to use the Tectus jigs and templates? Does the leading edge of the door need to be beveled? What's the throw on these? What's the minimum door thickness for these hinges? How do you calculate the hinge de-rating for doors over the standard 1-meter width? What happened to the old models? 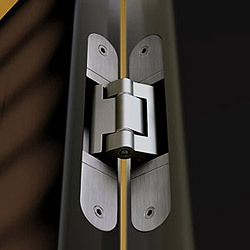 Tectus Hinges are engineered for their load capacity with two hinges installed. Officially, adding a third (or fourth hinge) does not increase the rated hinge capacity. 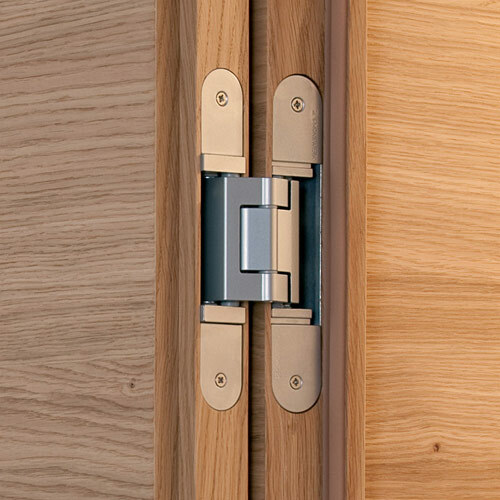 Simonswerk recommends a third hinge for doors taller than 96" in order to check any warping of the door, as long as the door is under 39" wide. For doors wider than 39 inches, Simonswerk recommends a third hinge installed at 14" below the centerline of the upper hinge. The centerline of the upper hinge, itself, should be located 10" from the top edge of the door. Can't find your question? Ask us.